Reaching a consensus on anything is the greatest challenge in Bangladesh now. Like impatience in political arena, political disputes over development, especially mega projects, are also very acute. 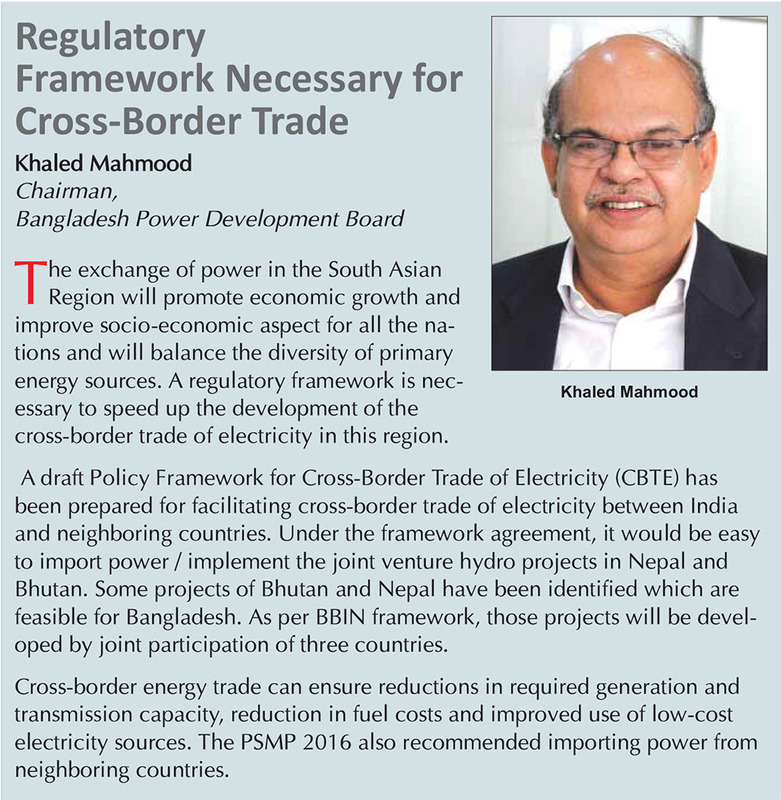 In consideration of Bangladesh, only there is a political consensus on cross-border power trade as suggested in a report titled “BBIN Electricity Trade in Bangladesh – A Survey of Prospect and Challenges” conducted with the financial support of Asia Foundation. Politicians, academics, bureaucrats and representatives from the civil society and other relevant organizations considered cross border power trade a good initiative. They suggested expanding the initiative while some others viewed limiting imports to 25% of the demand. The Power System Master Plan (PSMP) 2010 set a power generation target at 40,000 MW by 2030 – half of which was due to come from coal and 60% of it was thought to be contributed by local coal. Of the remaining half, about 25% was planned to come from local gas and imported LNG and around 3,500 MW was planned to come from cross border power trading. But in accordance with the PSMP 2016 which remains under the approval process, around 60,000 MW of generation capacity is targeted for 2041 — 35% of this would come from coal, another 35% from domestic gas and imported LNG. In this plan, contribution of local coal restricted to be only 1% and the remaining 34% is planned to be contributed by imported coal. Increased target for gas-based power generation has been set considering the LNG import initiative. In this plan, 15% of the generation target, meaning 9,000 MW, would be imported from regional countries. The present installed capacity, including the import, would be 15,593MW. The highest generation achieved at evening peak so far is 11,306 MW. Of this, 660 MW is being imported from India, including 500 MW coming through HVDC at Bheramara and 160 MW from Tripura radial mode. Another 500 MW HVDC construction is completed at Bheramara. Bangladesh Power Development Board (BPDB) has completed formalities for importing 300MW from NVPN and 200 MW from PTC. But for unknown reason, in absence of Power Purchase Agreement, the import has not started yet though the PGCB-owned HVDC is ready for operation. According to a source, the two companies could not sign the PPA with BPDB due to delay in getting go-ahead from the Indian government. An official at the BPDB told EP that the PPA would be signed soon. For importing more power from Tripura, a financing agreement for setting up of a HVDC at Comilla would also be signed. The construction would start soon and is expected to be ready for operation by 2019. By the end of this year, the import from India may increase to 1,160 MW and by end of 2019 to 1,500 MW. Besides, a tripartite – Bangladesh, Bhutan and India – MOU has been finalized for joint-venture development of a 1,500 MW capacity hydropower plant at Kuri 1 in Bhutan. For last few months, it is waiting to be signed. One source informed that the signing is being delayed due to reluctance of India. It is not possible to say at this stage when the MOU would be signed, when the construction would start and when the plant would come to generation. Besides, the Indian company Adani Group has signed a contract with Bangladesh for setting up of a 1,600 MW capacity power plant at Jharkhand and export the power to Bangladesh through a dedicated power transmission line. It may start operation by end 2020. 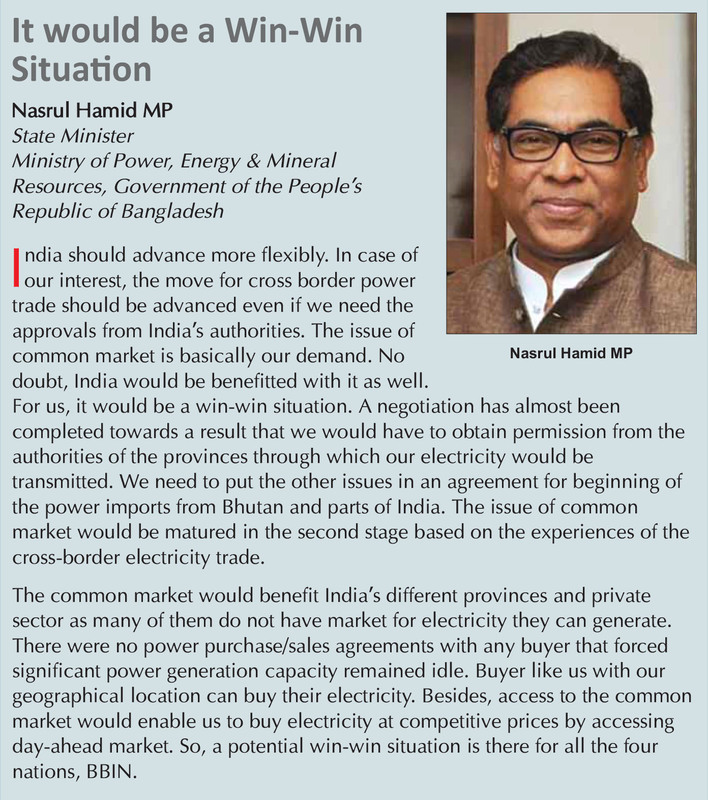 Taking this into consideration, Bangladesh may import up to 3,100 MW power by 2021 through cross border trading. The talks of power trading started since late 1990s. At the early stage, the discussions were mostly limited to technical possibilities. But necessary political will was missing to drive this initiative forward. This initiative got impetus after Awami League government returned to state power in 2009. Prime Minister Sheikh Hasina advised for giving highest priority to cross border power trading. At the early stage, this trading was thought to be covered under South Asian multilateral collaboration. But India always pressed for bilateral trading. On that consideration works advanced for power import from India. As its follow up, a MOU for power import from India was signed at the secretary-level meeting in November 2010. A power trading agreement was signed between India and Bangladesh during the Bangladesh Prime Minister’s visit to India in 2011. Under this agreement, power trading commenced through Bheramara HVDC from October 5, 2013. The Prime Ministers of India and Bangladesh through video conferencing formally inaugurated the power trading. Starting at 250 MW, now the import has increased to 500 MW. India started importing power from Bhutan and exporting to Nepal before this initiative. This was definitely a milestone achievement for the Bangladesh government. At the early stage, different stakeholders in Bangladesh had apprehension that India might exploit this politically. But the experience over the last 5 years dispelled all the doubts and confusions. Rather successful operation of cross border power trading between Bangladesh and India has opened up avenues for commencing greater regional power trading in South Asia. The State Minister for Power, Energy & Mineral Resources recently expressed optimism that by 2041 it would be possible to import 10,000 MW power from India, Nepal and Bhutan through cross border trading. But many termed it as an over ambition. It would be possible to import up to 4,000 MW. The Bheramara HVDC can be updated to 2,000 MW of capacity. On the other hand, starting with 500MW Comilla HVDC can be upgraded to 1,000 MW. It would be possible importing 3,000MW through these two links. The import of power from Nepal and Bhutan is contingent upon completion of power transmission line from Assam to Bihar. The talks for importing power from Myanmar and China are also at a very early stage. There is no scope of any development on these until the Rohnigya issue is resolved. Experts do not agree to consider the Adani initiative to supply power to Bangladesh as cross border power trading. JICA while preparing PSMP suggested restricting power import 10-15% of the total demand. In the proposed PSMP 2016, the target is 15%. Few years back, it was agreed in principle to utilize Bangladesh as a power transmission corridor of BBIN and the Eastern States of India to mainland India. The initial plan was to construct 765KV power transmission line from Rangia Raota of Assam to Mozaffarabad of Uttar Pradesh. Bhutan and Nepal could be connected at Assam and UP section. But techno-feasibility studies show that this may require investment of Rs. 2,100 crore in Indian currency. Some amendments were made in the technical planning. In the amended plan, it was decided to construct 765 KV transmission line from Barnagar in Assam to Katihar in Bihar. The estimated cost for this was Rs. 500 crore. It will traverse across Parbatripur of Bangladesh. Bangladesh would construct a HVDC substation at Parbatripur to purchase power from this line. But this project is now in a stalemate situation following India’s proposal for joint investment in this 400 KM power transmission line. No decision could be reached in the last two joint steering committee meetings for stubborn attitudes of both the parties. On condition of anonymity, one official at the Power Division of Bangladesh told EP that as Bangladesh would provide corridor for the power transmission line, India should make entire investment. But we will make investment for HVDC substation for purchasing the power. It’s expected that a positive decision would be taken in the next meeting. Besides, there has been no progress for a long time in hydropower purchase proposal from Myanmar. The present crisis emanated from Rohingya issue has put this proposal beyond any consideration in the foreseeable future. China has also expressed intention to export power. But the construction of power transmission line would require huge investment. This would not be feasible unless the power is very cheaper at Chinese origin. While taking to EP, academics and environmentalists have stressed on importing non-carbonized and environmentally friendly hydropower from the neighboring countries. This would reduce carbon foot print to a great extent. The Asia Foundation report on BBIN power trading indicated that the phase wise cost reduction of solar power is increasing, which is diminishing the interest on hydropower generation in India, Nepal and Bhutan. This has created doubts about extent of hydropower import from India in future. 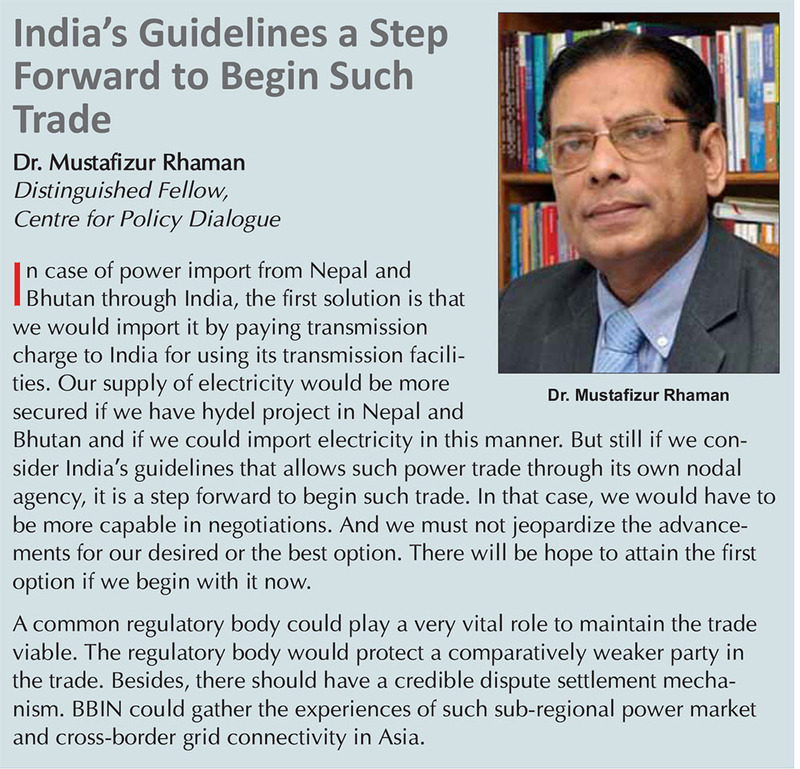 But commencement of BBIN power trade may facilitate increasing access to hydropower from Nepal and Bhutan. A seminar in January 2018 in Nepal was told that by 2030 Nepal would implement at least 10,000 MW capacity projects. Bhutan is also continuing construction of hydropower projects. Consequently, if Bangladesh intends, it can purchase higher amount of hydropower from these possibilities. The essence of SAARC energy cooperation and power trade was multilateral cooperation. India being a signatory appears reluctant to go by this. A recent order of Indian Power Ministry confirms such stance of India. It states that if any country invests in a power generation project with the intention to import power from across Indian territories, it must be done through Indian government enterprises. Indian investors are opposing it. Indian Power Regulatory Authority has also announced regulation. In different seminars, the Indians are saying that this legal barrier would not sustain. But crisis remains as this regulation has not been withdrawn yet. An Indian company has proposed to sell power from Nepal to Bangladesh. But the existence of Indian regulation impedes GMR to conclude Power Purchase Agreement with Bangladesh. There are scopes for buying power at attractive rates from private producers of Indian power market through competitive bidding. But here too, the law is a barrier. Analysts observed that Bangladesh has to import power under comprehensive multilateral agreements if it intends to achieve 9,000 MW targeted for 2041. It is not possible to do that under bilateral agreements. But India is still not agreed to go beyond bilateral agreements. Any thought of successful regional power trading through sidetracking India is weird. However, analysts are optimistic that eventually Bhutan, Bangladesh, India and Nepal would start regional power trading. 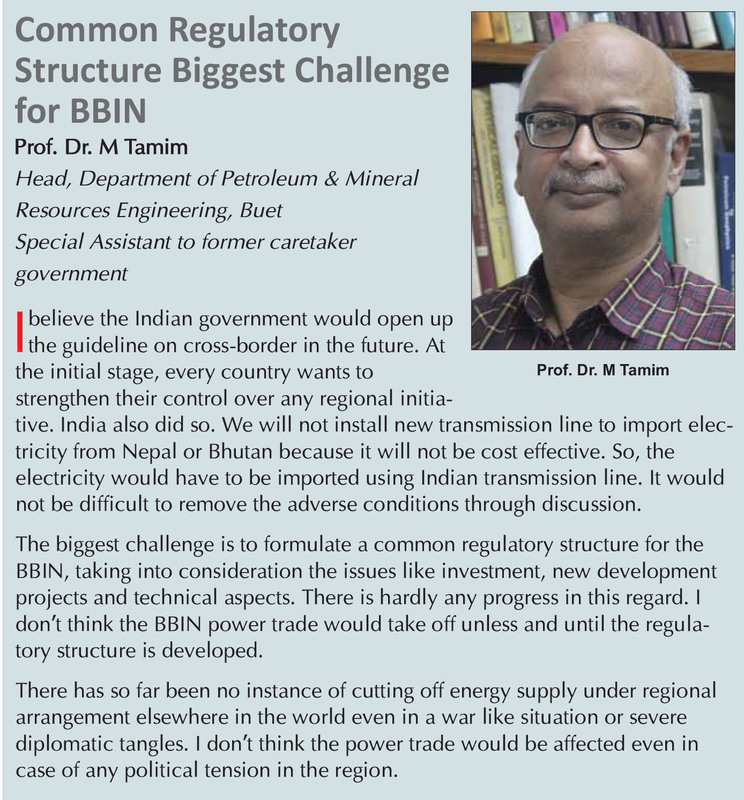 Possibly some day, BBIN grid would be linked with the ASEAN grid. Free power trading like EURO grid would be possible.